Come and experience Auckland City’s newest attraction. FLY A JET Flight Simulator where YOU ARE THE PILOT! Take control of a JET AIRLINER simulator and experience the challenge and the fun of flying this popular aircraft. For fun, pilot training, corporate events, team building, birthdays and more. FLY A JET provides an unbeatable experience! No previous experience required to book any of our flight packages. Suitable for ages 5 to 95. Realistic day and night time visuals and real-time weather and condition reports contribute to making your flight experience just like the real thing. The effects are so good it is CAA approved as a pilot training simulator. You don’t need any prior experience, so come on by! Corporate entertaining at FLY A JET is fun, exciting, easy and provides an atmosphere of intimacy with our Jet Airliner simulator. Everyone gets a chance to fly while others can watch from within the cockpit. Prefect for Christmas Events, Corporate Events or Team Building. FLY A JET Pilot Training programme offers the most cost effective learning environment with real avionics, operational flight deck instruments and environment plus a full wrap around 180 degree visual screen with realistic graphics. Realistic day and night time visuals and real-time weather and condition reports contribute to making your flight experience just like the real thing. The effects are so good it is CAA approved as a pilot training simulator. 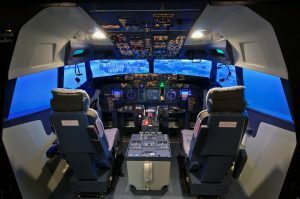 The FLY A JET flight simulator is CAA approved as a pilot training simulator and the cockpit layout is an almost exact duplicate of a real working Jet Airliner. But you don’t need any previous experience to operate this amazing piece of technology as we can adapt the package to suit all levels and there will be a qualified pilot to assist you! Outside the cockpit – there is a high fidelity, 180 curved screen projector providing realistic visuals of airports, terrain, landmarks, weather patterns, day/night and more. With these features, in addition to the full set of avionics – The FLY A JET experience delivers one the most realistic flight simulator experience, accessible to the general public, in New Zealand. View the video of our presenter Bruce Hopkins in his first flight simulator experience here. 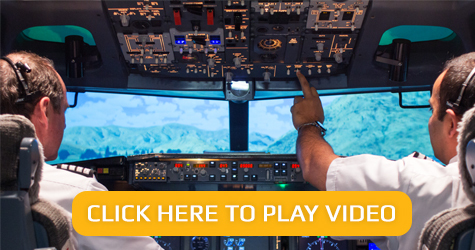 View our Video Gallery for more Flight Simulation videos. Purchase online via Polipay and Payment Express. Forget tickets to the cricket or golf, or a boring dinner where everyone struggles to make conversation and you can’t wait for it to end! We cater for Christmas Events, Corporate Functions, Team Building Exercises, Birthdays and more. Corporate entertaining at FLY A JET is fun, exciting, and easy and provides an atmosphere of intimacy with our Jet Airliner simulator and your guests as the focal point. Everyone gets a chance to fly while others can watch from within the cockpit in the jump-seats or outside in our intimate first class lounge, watching large TV monitors and a live feed from the flight deck. This environment of common interest encourages easy discussion and networking for your guests. Our Corporate Challenge is designed to encourage light-hearted fun and rewards are offered to guests for a variety of outcomes throughout the event. We can cater for small groups of two or three guests up to larger parties of around twenty to sixty people. With a degree of apprehension about who will put in the best flight performance or landing an element of competition soon arises. 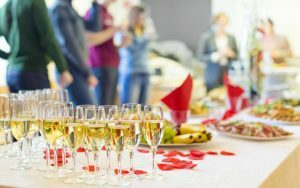 Themed product launches, training evenings, rewards for staff and clients, Team Building or simply an afternoon of relaxing fun for the office personnel are all possible at FLY A JET. Events can be tailored to suit your individual requirements. FLY A JET is fully licenced with a great range of alcoholic and non alcoholic beverages at very reasonable prices. FLY A JET follows responsible host policies. Many levels of catering and refreshments are available. You can view an example of our menu items here. Prices for Corporate Entertainment start from only $300 (plus GST) for up to five guests. Our venue can accommodate up to 73 people. The FLY A JET Pilot Training programme offers the most cost effective learning environment with real avionics, operational flight deck instruments and environment plus a full wrap around 180 degree visual screen with full graphics providing an extremely realistic overall experience. FLY A JET Pilot Training is realistic and intensive – but at a fraction of the cost of other flight training options. Includes experiencing the Multi Crew environment and teaching the skills required for pilots to perform duties and communicate as a two-pilot crew in a modern jet aircraft. FLY A JET Simulators are commonly used for this application. The simulator is ideal to be used to conduct Assessments as part of the Pilot Recruitment Process to test the various pilot skills required. Pilots with upcoming assessments can also use the simulator for preparation. 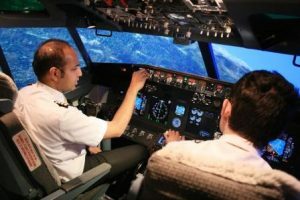 The simulator is used by pilots planning to complete a Jet Type rating to gain familiarity with the aircraft systems and operating procedures. Remedial Training and revision exercises can be executed prior to airline specific type training.